Samsung was among the first major phone makers to usher in the bezel-less design trend that's taken the mobile world by storm and is seemingly on its way to become the next de-facto norm for smartphone industrial design. The Galaxy S8 and S8+, followed by the mighty Note 8, were all running successes for Samsung, and looking back now, it's kind of hard to believe that the S8 is actually over half a year old. Yup, the iconic bezel-less duo released back in April, and think about this – that was 6 months ago and there's about 7 months, give or take a week or two, until their successors are revealed! Does this make you feel old? Wait, that's not how this works. Anyway, although we are a few good months away from seeing the Galaxy S9 and S9+ for ourselves, we know they're coming. Heck, there's already rumors floating around about Samsung's next crop of high-end smartphones. So, what do we know about them? Well, the details are still kind of murky, especially as far as specs are considered, but we know a little bit about the designs, and that's quite important in and of itself. Right off the bat, just don't expect another major redesign. In fact, it'll be a good few years until we see a new design trend take off like bezel-less did in 2017. There simply isn't enough room left—quite literally—to squeeze in more display on a phone, at this point at least. With this in mind, it's safe to assume that the Galaxy S9 and S9+ will be more of an evolution, a refinement, of the S8 design, rather than a drastic departure. Samsung may shave off a bit of the top bezel and even completely remove the one on the bottom, but that's about it. We've gotten to the point where incremental upgrades and changes in smartphone design and hardware are becoming so slow and expensive, that you can't really expect a revolution with every generation. 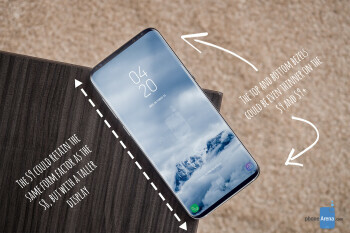 In fact, forget about the displays of the S9 and S9+, because they'll just be next-gen Infinity Displays with an 18.5:9 (or iPhone X-like, taller 2.17:1 aspect ratio), and let's think about their backs for a second. That's where Samsung has the freedom to move things around and build on this year's designs. And to see how Samsung may improve on the S8 design, one need to look no further than what the future holds for the company's midrange A-series. 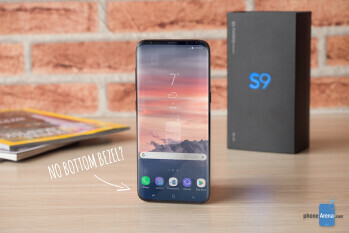 How to adequately address one of the sore points of the S8 design? The next entries in Samsung's A-series—the A5 (2018) and A7 (2018)—are heavily tipped to both sport bezel-less designs with fingerprint scanners on their backs. 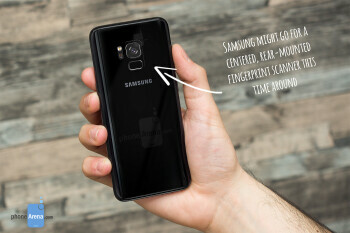 What's more interesting, however, apart from the fact that the bezel-less trend is spreading to the budget sector, is that the new A-series models will likely have centered, rear-mounted fingerprint scanners, unlike the S8/S8+ and the Note 8, all of which have their fingerprint scanners offset next to the cameras, instead of below. And as you probably already know, the placement of the fingerprint scanner has been one of the major complaints about these three otherwise excellent devices, and Samsung knows this. Argue all you want that it's just a matter of getting used to it, but that's just not an optimal location for a fingerprint scanner, especially when using the phone with your left hand. Having the scanner centered below the camera allows for effortless accessibility with both hands and it just makes sense. Not to mention that this will also minimize the chances of accidentally placing an oily finger on the camera instead of the scanner. Samsung may have shunned away from implementing a dual camera setup on either the Galaxy S8 or the S8+, but this won't be the case next year with the S9 and S9+. Although we can't know for sure whether both models will be blessed with two cameras—there's a good chance that Samsung may want to reserve it for the S9+ only—it's a relatively safe bet that at least one of them is getting a second main camera. How Samsung decides to position the two lenseswill also play into the placement of the fingerprint scanner. It could be a Note 8-style horizontal array (although we've got our fingers crossed for something different), or a vertical dual-cam setup with the fingerprint scanner below. As far as the displays of the Galaxy S9 and S9+ are concerned, it's a safe bet that the two will be outfitted with next-gen InfinityDisplay AMOLED panels with a QHD+ resolution of 1440x2960 (or above). 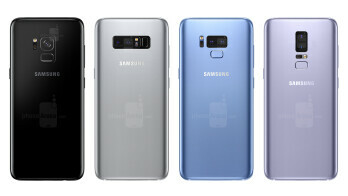 As for the bezels – the top one is likely here to stay for a while, since there's so many sensors housed inside, and even if Samsung could drill holes for all of them in the display itself, it would just look like Swiss cheese. And speaking of sensors, the S9 and S9+ are tipped to feature 3D scanning, which means at least one more opening in the top bezel would be needed to house a structured light transmitter. But let's not go there right now. And while the top bezel is likely not going anywhere for the S9 and S9+, although it could be slimmed down a bit, the bottom bezel might be on its way out. Nothing is known for certain at this point, but seeing as how the front-facing fingerprint scanner isn't coming back, the bottom bezel has no functional purpose, at least in its current, almost non-existent form. It's cool to imagine what the Galaxy S9 and S9+ may look like without the bottom bezel (they'd look even sleeker), but we can't say for sure if this is the next step in the evolution of Samsung's Galaxy S-series. Well folks, that's all we got for today. What do you think about all that? Where would you rather have the fingerprint scanner located? Below the camera, or next to it like it is on the S8 and the Note 8? You probably want it to embedded in the display, and so do we, but that's not a likely scenario, unfortunately. What about the bottom bezel? Are you fine with what little there's left of it, or would you rather have it completely eradicated?